We’re big advocates of co-sleeping here at Inhabitots, as we believe it makes life easier and healthier for both mother and baby and is helpful for creating a special bond between parents and children. However, it is not advisable to try to turn any old platform bed into a ‘family bed’ without some sort of modifications. For those of you who are interested in co-sleeping, but have a raised platform bed, don’t worry! Your salvation has arrived in the form of the Arm’s Reach Co-sleeper – a small bassinet-type device that attaches to the side of your bed so that your baby can sleep safely in his own bed, just an arm’s reach away from you. 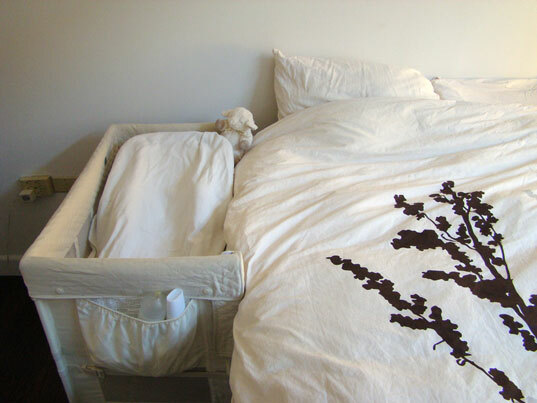 Co-sleeping is inherently safe if done correctly, but parents need to be mindful and disciplined about how they set up their beds, so that they optimize the safety of their little ones. Every year there are incidents of babies getting injured from falling off a bed, getting rolled on by one of their parents, or becoming trapped in the crack between a bed and a wall. I don’t want this to sound alarmist, because the truth is that co-sleeping is very common and very safe. (There are about 10 times as many infant deaths in the US from SIDs each year than there are from co-sleeping accidents) Co-sleeping is widely practiced around the world (especially in developing countries where people don’t often have the luxury of a special room and crib for baby), and has been shown to protect against SIDs. However, it is wise to use good judgment about how to co-sleep, as your baby is a fragile little creature who can’t move out of the way if you or a pillow moves onto him. 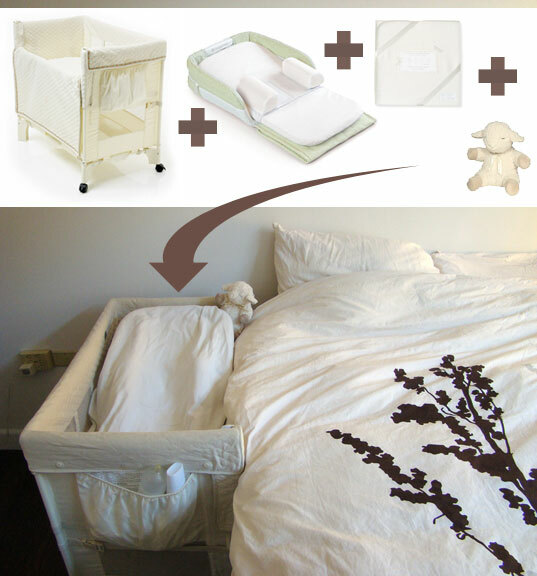 Before my baby (in the top image) arrived, I had thought vaguely that I liked the idea of co-sleeping, but I didn’t really think about the particulars of how I might want to set up my bed so that an infant could safely sleep in it. Pre-baby I spent a lot of time purchasing and putting together an all organic, queen-sized bed that is very high off the ground, somewhat squishy, and not at all ideal for safely sharing with an infant. (An ideal family bed would be king-sized, firm and would sit right on the floor). By the time the baby arrived and I realized what was best, it was too late to change our bed, but we were still able to find a great co-sleeping solution with the Arm’s Reach Co-sleeper. Though certainly not the best looking infant bedding option, (by a long stretch) — what the Arm’s Reach Co-sleeper lacks in aesthetics, it makes up for in usefulness. (Psst… Next step Arm’s Reach team: please freshen up the aesthetics of this sucker!) Frumpy aesthetics aside, this sidecar co-sleeper truly is a great invention. 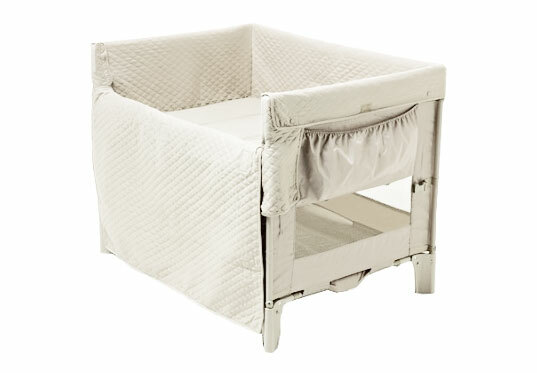 Just hook it up to the side of your bed, and you have the perfect little infant bed that protects your baby from rolling over or falling out, and also allows you easy access to nurse and snuggle baby. When our baby was very small, we put a device called the ‘Supreme Snuggle Nest’ in our Arm’s Reach Co-sleeper to keep our baby from rolling off of his back, and also to position him at a slight incline (to prevent acid reflux and spitting up). It worked like a charm! Now that our baby has passed the colicky spit-up stage (and grown bigger), we’ve removed the snuggle nest, and he just sleeps on the Arm’s Reach mattress as is. I highly recommend the Arm’s Reach Co-sleeper to any parent who is considering co-sleeping, but is a little nervous to start (or has a raised bed unsuitable for an infant). Now if only the Arm’s Reach came in eco modern flavor! Any suggestions for expectant parents with a low-platform bed (such as the west elm one)? The problem with our bed though, is that it is the low platform bed. So with the mattress it is less than 10" off of the ground (plus there is a 6" or so lip around the bed). I suppose that the humanity family bed is more suited for us (we do have a queen-size), but the cost is probably too much for our currently single-income budget. Arm's Reach 'organic' products are Made IN CHINA! I bought their mini cosleeper mattress at greater cost than the co sleeper itself that we already had, because it was organic. I opened it to see MADE IN CHINA on the label, and then opened the plastic to smell off gassing chemicals! How could anyone possibly trust the inspection process there? No doubt the whole reason many of us have discovered the need to go organic is because of the incessant horror stories of products from China. I strongly recommend you stay away, unless organic and toxic are interchangeable for you. A very late comment, but we used the Babybay with ours (in fact, it is still attached to the bed until she's firmly settled in her own room, and doesn't need to come back for cuddles). Aesthetically pleasing, and there is an untreated beech eco option, and they hold their value well (hint - I would get one second hand, and resell, and you won't have paid much more than the postage). How did you incline the arms reach co sleeper? We're big advocates of co-sleeping here at Inhabitots, as we believe it makes life easier and healthier for both mother and baby and is helpful for creating a special bond between parents and children. However, it is not advisable to try to turn any old platform bed into a 'family bed' without some sort of modifications. For those of you who are interested in co-sleeping, but have a raised platform bed, don't worry! Your salvation has arrived in the form of the Arm's Reach Co-sleeper - a small bassinet-type device that attaches to the side of your bed so that your baby can sleep safely in his own bed, just an arm's reach away from you.